The iStick Pico RDTA comes with a iStick Pico RDTA, two Clapton coils, a Pure cotton, and a USB Cable. The size of iStick Pico RDTA is 50mm*24mm*100mm and the weight of the iStick Pico RDTA is 148.7g. And it is very comfortable to hold and carry. There are four colors in total: Black P2, Silver P2, Black P1, and Silver P1. 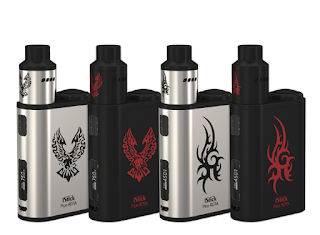 Powered by a 2300mAh capacity battery, the iStick Pico RDTA can fire up to a maximum power of 75 watts. With Dual Circuit Protection and 2A Quick Charge Capacity, you can charge it full more quickly and safely. Features retractable top fill system, detachable structure for easy cleaning, and 8-Hole Extensive and Adjustable Airflow, you will enjoy a pleasant and great vaping experience with enhanced taste. The E-liquid capacity is 4.2ml. Equipped with a large side fill port, you can refill the tank conveniently. The big fire key is designed on the top of the iStick Pico RDTA, much easier to operate than before. There are three switchable output modes: VW mode, Bypass mode, and TC mode.